A few months back, I wrote about AT&T's It Can Wait campaign. Hopefully you've signed the No Text on Board pledge by now but if not, let this be another reminder. We are all busy these days but there is nothing as important as arriving alive. Keep your eyes on the road, people. This video shows texting and driving from a unique perspective: the phone's. 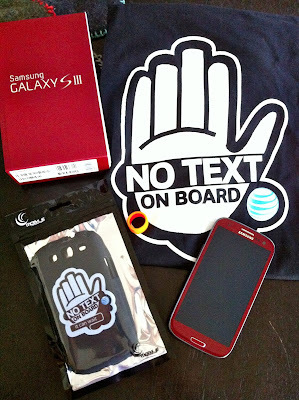 As part of the It Can Wait campaign, I received the care package pictured below, featuring the Samsung Galaxy SIII Android phone, a No Text on Board tee and case, stickers and jelly rings. When the Samsung Galaxy S III landed in my hands, I wasn't shopping for a new phone. I was somewhat satisfied with my third HTC Android phone and particularly uninterested in adapting yet another phone to my specific needs. Getting the hang of a new phone always sounds like an easy, fun, worthwhile process until you get far enough into the transition that it's too late to turn back. Kind of like having additional children. The first glimpse of a shiny red phone with a crisp, bright display had me hooked. I use my phone to take a lot of photos of my kids and dogs to share on a variety of social sites. I was surprised to find the flash on the Galaxy S III actually makes for better photos rather than washing out the subject with too much light. I used to rely on apps to clean up my photos but I don't need that anymore. Another surprise was the lack of shutter lag. Now the photo I end up with the one I expect to see. I am still getting used to the 4:3 aspect ratio which is quite different from 16:9 on my previous phone. My fears about setting up the phone to suit my needs were quickly allayed. Once I signed in with my Google account, my apps started downloading and my contacts were accessible. It's no longer a struggle with getting Facebook events to show up on my calendar. Adding my work email was also a breeze. I still have loads of features to explore. Since I have my phone with me everywhere and the battery holds up amazingly well, I have abundant opportunities to play with the options and learn how to make everyday tasks easier. Most recently I figured out how to capture a screen shot. You swipe across the screen with the side of your hand. It's quite clever and not the clumsy process other Android phones use. Would I be open to upgrading to a new phone now? Unlikely! The Galaxy S III is perfect for my needs, looks sharp, and holds up well. I have to admit when I saw her photos start popping up on FB, Twitter and Instagram, I was impressed. The clarity and color of the images are really nice. It made me want the new Samsung Galaxy camera! Anyway, AT&T has generously offered to give one of my readers the same package. Enter to win using the form below. In accordance to the FTC Guidelines and the WOMMA Code of Ethics, I am disclosing that I am an AT&T customer and received the items pictured for review purposes. No compensation was provided for this post. All opinions are, as usual, entirely my own. I took the pledge! I think its great that they're trying to address this...I know I haven't always been responsible in the past, and at least 50% of the time when someone is driving erratically, I pass them and see the glow of their phone...so stupid and dangerous! Also took the pledge- there is NOTHING I need to say that can't wait until I'm stationary. Thank you, Naomi, for the opportunity to take the Samsung Galaxy SIII for a spin. I am loving it. I like that it is an Android, I don't have a smartphone. I like that it is an android. I took the pledge. There is never anything that's important enough to text while driving. I took the Pledge. I am for anything that raises awareness to this problem. I took the pledge... I see a lot of young people texting while driving.... going much slower than the rest of traffic, a complete hazard! I'm good about not texting or using the phone while driving. It's the law here, so in addition to being unsafe it is costly. I occasionally check a text stopped at a red light. I usually have passengers who can communicate for me. I hate seeing people driving and texting. I pledged! I like that taking the pledge might actually make kids think twice about doing it! I took the pledge! I love that this is an Android! Would love to win this for hubby! I took the pledge. I like the smart stay on the phone. Very cool! I took the pledge long ago and I just want to say that it's very important we concentrate on driving and not have any distractions, we don't need to have an accident because of some silly thing as texting and such. It's preventable! I took the pledge. And I ADORE the lack of lag on the SIII. I actually saw it in action this weekend from a friend's phone I drooled over. I love that my photos would be of what I want them to be of! I took the pledge...and I LOVE the camera on the Samsung Galaxy SIII!!! Took the pledge & I am on a SamsungGalaxySIII now (reviewing it) and I love the camera & the huge screen! Actually there isn't one thing I don't like about this phone. I took the pledge and it's great! Especially since I live on a military base and military police are crazy strict about any cell phone use while driving! I took the pledge! I'm also very serious about not texting while driving. As much of a treat as an SGIII would be, I've seen too many accidents because someone couldn't wait until they stopped the car to text. I pledged - and like that there IS a pledge; I think people take it more seriously when they have made a commitment. I think the pledge is one step in an important awareness program. Texting while driving is dangerous and we need to make sure people know and remember that. I like the attention addressed at teenagers not texting and driving. i took the pledge!! everything about this phone is awesome!! my kids father has it and i am sooo jealous!! he said he was gonna get me one for my bday (11/30) and didnt, then he said x-mas and didn't, so i need to win this myself!!! the phone is better than most phones out i think!!! We can't remind people enough about how important this is. This pledge could very easily save a life. I like your No Text on Board campaign. I pledged. I have three nieces who just got their DLs. Took the pledge, a text is nowhere near as important as a life. I pledged and I love how the program shows real stories and uses statistics to educate us. Thanks for the wonderful giveaway and for getting the word out. I took the pledge and as a driver in the DC/MD area, I'm thankful this program exists. It's bad enough that people walk around with their faces in their phones -- directing a missile while texting is crazy! I took the pledge. I like that you can touch two phones together to transfer files. I took the pledge. People don't realize how dangerous texting while driving IS! I like that the message is being spread through social media where it is more likely to get it's target audience. I like that its an android! I took the pledge. I will stop texting while driving. I took the pledge! It worries me a lot when I see people trying to text and drive. I took the pledge and I love that the phone shoots video in full 1080p HD! I love the program helping save lives and the phone looks amazing! I really like about these program because they are helping those people who are prone to accident in driving while on board, I salute you CINDY KELLY and your friends and about the phone, I really want to have that kind of cellphone because I don't have at least one cellphone and hope I win this contest.Thank You and God Bless!!! I like the program because too many people are on the phone talking or texting and not paying FULL attention to driving..Even if this program saves one life it it worth it! I took the pledge. This is such a good campaign,lives will be saved. I took the pledge long ago...hopefully the message gets out there. I took the pledge. What a wonderful campaign! Took the pledge. It keeps everyone safer on the roads! I like that the program promotes awareness about not texting and driving. A few months ago a biker was killed because a driver was texting. Some people just don't realize how dangerous it is until it's too late! I took the pledge. It's really crazy what you see some people doing out there these days. That text message or email just isn't worth it! It can wait!! The thing I love about the S III, is the speed and screen size...nothing out there really can touch it. Thank you! I really like the beautiful screen. I took the pledge and I like it that they are really trying to get the word out. I love the size of the screen on the phone. I like the fact that its making everyone aware that there's nothing more important that keeping your eyes on the road for the safety of yourself and others! I`m an EMT and can tell you, there are many many accidents because of this. People on the phone not only hurt themselves, but other, innocent drivers on road. Very sad. I took the pledge; I like that there's an option to share it on facebook. Talking or texting while driving drives me nuts! I took the pledge. So many people think it can't happen to them, but texting/calling while driving is such a distraction and can have horrifying results. I applaud this pledge helping spread awareness and I can only hope that more people start taking this seriously. i like that they are tring to keep people aware of the danger of txt and driving. I proudly took the no texting while driving. I really can't understand people who text and drive, it makes no sense. I took the pledge, I never text and drive. I will spread the word. I pledge to Arrive Alive - No texting on board. I took the pledge. I like that this would be a great upgrade from my current phone! I take the pledge. It is a great program, more people need to be aware of the dangers of texting wile driving. I see so many people doing it still. I like that it's trying to keep people safe on the roads and I LOVE Samsung phones!! Took the pledge. It can wait. An epedemic in the cause of accidents. I have been wanting to upgrade to a smart phone and the Samsung Galaxy is the cadilac. I take the pledge and this is an awesome campaign. I take the pledge and it's a great campaign to educate others about the dangers of texting while driving, and this cause could save more life. I took the pledge and i love that it brings more awareness to how wrong texting and driving are. I took the pledge and its a great campaign and an awesome phone! I think every teenager should watch the video. I took the pledge. This is a serious issue that more companies need to put out there. My cousins step father was killed by a girl who was texting & driving. A lot of people think it can't happen to them, but it does. I think the phone looks awesome! SO many features & a long battery life! I took the pledge and shared on my FB page... I love the fact that this is an android phone, which is what I am used to using, and the fact that it takes great pics! I love the color of this phone especially with Valentine's Day around the corner...also this pledge is such a GREAT idea! I took the pledge, and I think it's a great program. I took the pledge and I think it's important to bring awareness of how dangerous texting and driving is so I love the program! Its such an important message so its great that they are getting it out there. Love the Android operating system! I pledged, which was not hard for me, I lost a friend to a driver who was texting. This hits home for me and I am glad to see the word is getting out about the dangers of texting and driving.